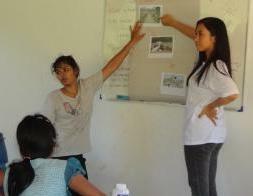 In November, two interns from Andaman Discoveries conducted a three day seminar on environmental awareness. Students were introduced to the basics of the environment, ecosystems, interconnection of living things, waste management and the effects of pollution. Through illustrations, comparisons and flash cards students were able to identify the different living things they see around them, positive and negative actions and ideal scenarios. Waste is an unfortunate problem in the surrounding areas of the school and students were asked how their household practices can affect the local environment. Reusing, recycling and composting were introduced to the school and the students were given a chance to help create the ‘compost recipe.’ The center is planning to use their compost in the organic garden that a group of volunteers from the last quarter helped build. Our intern Umillah from Brunei sponsored a recycle bank for the school and trained the teachers on proper administration of the bank. Everyone was actively engaged and in very high spirits at the end of the seminar, we look forward to the results of these efforts.